Strickland State Forest is a special place, living exhibition of exceptionally diverse forest habitats: wildflowers and dry heath woodland in the north, tall eucalypts on its slopes, through to lush rainforest in the south. This much-loved State Forest is located on the Central Coast of NSW, less than an hour's drive north of Sydney, south of Newcastle, or a 10-minute drive west of Gosford. Strickland State Forest is considered a unique ecotourism destination. For a relatively "compact" State Forest of just 5 square kilometres, Strickland State Forest contains an impressive variety of flora and fauna species, with 350 plants, 98 birds, 29 reptiles, 27 mammals, 20 amphibians and 4 fish species recorded to date. Strickland State Forest has been inducted into the Hunter Central Coast Tourism Awards Hall of Fame after winning the Gold Award for Ecotourism three years in a row - 2011, 2012 and 2013. 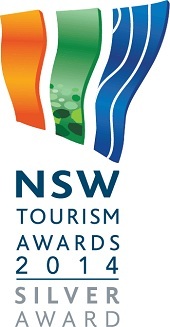 Strickland State Forest was also awarded silver ecotourism at the NSW Tourism Awards in both 2013 and 2014. Strickland has extensive walking tracks through varying forest types - past waterfalls, under cabbage tree palms and along creeks. These tracks were built and maintained by the volunteer group 'Friends of Strickland' in partnership with Forestry Corporation of NSW. The forest has excellent picnic facilities including an all-weather shelter, picnic tables and toilets. Strickland State Forest was the site of the first government forest nursery (1886-1890) and first national forestry training school (1920 – 1927). Remnants of native and exotic tree plantings established during those times – known as an arboretum – are now among the oldest in Australia and can be seen on the Arboretum Track. Strickland State Forest is a gated forest and so is for day-use only. It is open from dawn to dusk. Welcome to Strickland State Forest! that Bunya Pine produce large cones the size of footballs which whilst spectacular in appearance, may cause injury. Please exercise caution and be mindful of falling pine cones during the January to March period. Banksia Picnic Area is a delightful spot set amongst contrasting colours of grey gums, pink smooth-barked apples and banksias. It is also the starting point for three walking tracks: Cabbage Tree Track; Stoney Creek Track; and Strickland Falls Track. Set high on the ridge, picnickers can enjoy views into Gosford and Brisbane Waters. A 10 minute drive from Gosford. Entry via Mangrove Road, Narara, or Dog Trap Road, Ourimbah. Bellbird Track is a loop walk off the Arboretum Track, following Narara Creek and meandering through rainforest. Bellbird and Arboretum Track combined is a total distance of 3.3kms. towards Banksia Picnic Area, pretty ferns give way to rocky ridges. You can choose to join Stoney Creek Track, which takes you to the lower Stoney Creek Carpark where other walks commence. Starting near the entry road to Banksia Picnic Area, the track gradually descends through dry forest types along the ridge into tall, moist forest and gully rainforest along the creek. Mossy rocks, statuesque trees and a planted grove of Hoop Pine are featured along the track, which was hand built over a 10 year period by the "Friends of Strickland" volunteer group. Stoney Creek Track is the link between Banksia Picnic Area and the lower Carpark. From the carpark follow the track down towards the Creek and here the track leads off to the right, heading upstream of Stoney Creek. Experience gully rainforest along picturesque rocky creeks, before walking up into masses of Cabbage Palms and joining Cabbage Tree Track. rainforest. Descending to the Fall, you will notice the change in humidity, temperature and size of trees. Spectacular cliffs, mossy rocks, ferns, palms, tall, moist eucalypt forest and gully rainforest are features of this walk. This track was proudly completed by the "Friends of Strickland" in 2003. Find out about the Friends of Strickland volunteer program. Find out about school excursions at Strickland State forest. A Special Purpose Permit is required for organised events and activities in State forests.